A fairly quiet situation has settled over Europe. 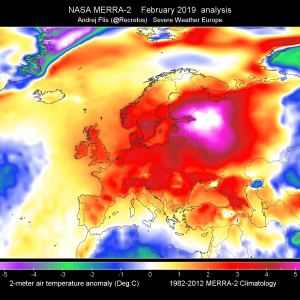 An rex blocking pattern is present with a strong ridge located over the Azores, a strong ridge over Scandinavia and a gradually weakening ridge over eastern Europe. An area of low geopotential is located between, over western and central Europe with a series of embeded lows. 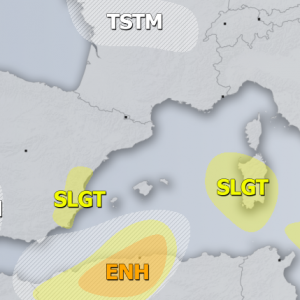 Severe weather potential is low over much of Europe, except for central Europe, which will see some excessive precipitation. A MDT risk area has been issued for Belgium, the Netherlands and parts of W Germany for excessive precipitation. 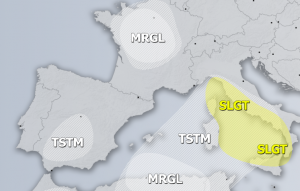 A SLGT+ risk area has been issued for S Switzerland and extreme W Austria for excessive precipitation. 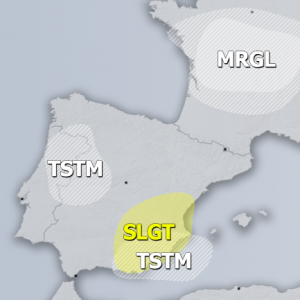 A SLGT+ risk area has been issued for NE Algeria and N Tunisia for large to very large hail, severe wind gusts and excessive precipitation. 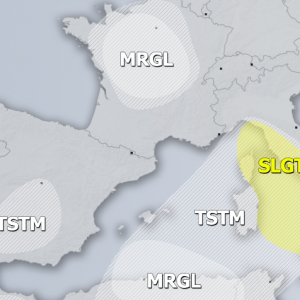 A SLGT risk area has been issued for the Netherlands, E-SE France, N Italy, Switzerland, W-CNTRL Austria, W Czech Republic and SW Poland for excessive precipitation and occasional funnels / landspouts. A SLGT risk area has been issued for SW Russia and NW Kazakhstan for large hail, severe wind gusts and excessive precipitation.